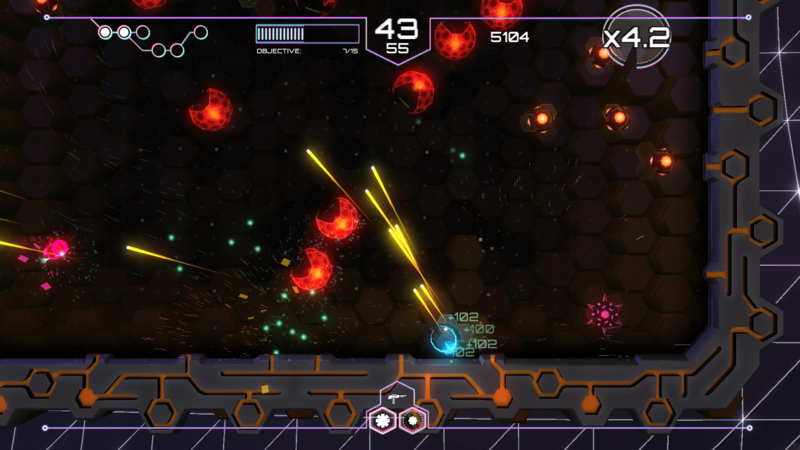 I don’t typically play a twin-stick shooter or a SHMUP for the story. Both genres are known more for their visceral gameplay, rocking tunes and flashy graphics, not their sweeping narratives. 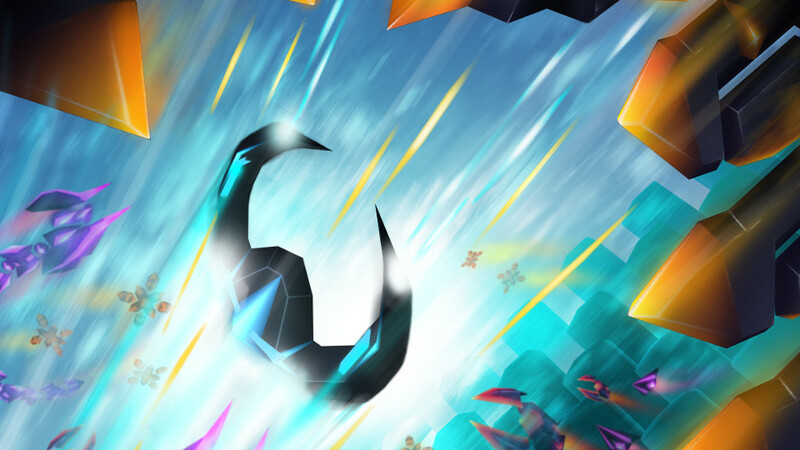 Thus, it was with some curiosity that I decided to tackle Tachyon Project. See, the game is a twin-stick SHMUP hybrid that is VERY heavily tied into a compelling storyline. The basic premise is that you control Ada, a sentient hacking program that is searching for her missing “parents,” the two programmers who invented her; a woman named Helen and a man named Halt. You will control Ada on her quest, told through moody comic book-style cutscenes with lots of foreboding dialogue. Doesn’t sound much like a typical SHMUP game, does it? But did this unique take on the genre impress, or was Tachyon Project a failed experiment? Tachyon Project is told through 10 separate levels each composed of six Waves. Beating levels will unlock component cutscenes to move the story along. This might seem short, but each Wave is composed of different objectives you need to accomplish to move on to the next. Typically, these objectives will range from simple ‘eliminate X amount of enemies’ to ‘survive for X amount of time,’ or even eliminating a certain type of enemy. It might sound basic, and it is, but it’s much more complicated, hectic and challenging in execution. For one thing, the game is constantly introducing new enemy types, and there is a huge assortment of foes. Some of my most feared were the Vortexes that randomly appear, sucking you into their field of gravity; stealth drones that rush you as long as you are attacking; shielded orbs that can only be hurt when they crash into the walls of stages; slow but powerful serpentine drones that can take tons of hits before they go down, and much much more. There is a great variety of enemy ships, and, though there is some overlap and upgraded foes, they all are distinct and challenging, not least of all because they often rapidly appear in devastating waves. You will only have a couple seconds to react as they materialize on the field, so hopefully your trigger fingers are ready. You’re probably wondering about how you deal with these foes, and this is where things get even more interesting. Since Tachyon Project takes place in computer mainframes, as Ada is a hacking program, it wouldn’t make a lot of sense for her to have a health bar. Instead, Ada’s “health” is actually represented in a timer that is constantly counting down. Blowing up foes adds more time to your clock, while taking hits reduces it, sometimes drastically when hit by the big boys. Even your secondary weapons tie into this mechanic. Each time you fire one of them, you’ll utilize your clock, followed by a brief cooldown before you can use it again. That is, assuming you aren’t really low on time, because, if you are, your secondary weapons cannot be used. I rather liked this, since it forced me to constantly be on my A game and not just sloppily crash into things. And crash into things you will, since each level is crazy hectic. 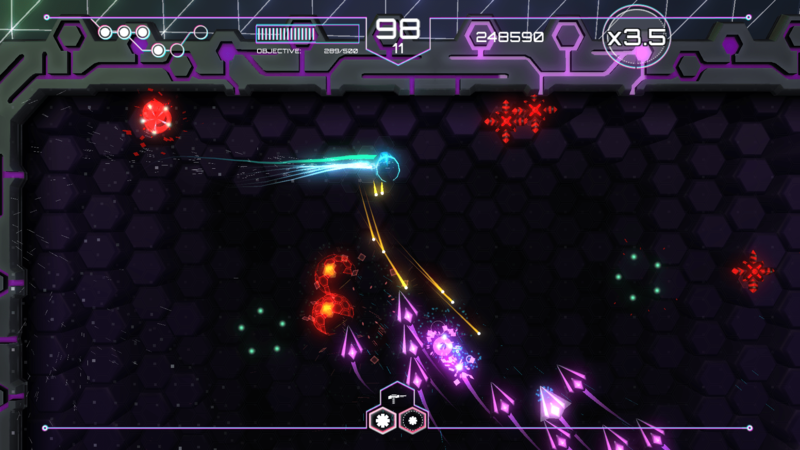 Another feature of Tachyon Project that sets it apart from standard SHMUPs is that Ada is constantly evolving. Your progress unlocks new Primary and Secondary Weapons, as well as Perks which can improve and alter your playstyle. For example, you start out with a Triple Shot weapon and basic Explosion, but I quickly gravitated to the Machine Gun weapon, improved ship Speed and Freeze Bombs, which temporarily froze almost every enemy on the screen. That might sound cheap, but, considering how crazy levels can get — often ramping up through progressive Waves — it really isn’t. You can set up your preferred Weapons and two Perks at the start of every level, and it pays to try out different combinations to make levels easier. This was especially helpful in the brutal Stealth levels, where visibility is limited, and foes track you when you fire your weapons. This boss almost made me break my controller until I realized I could slow his shields down with Freeze Bombs. 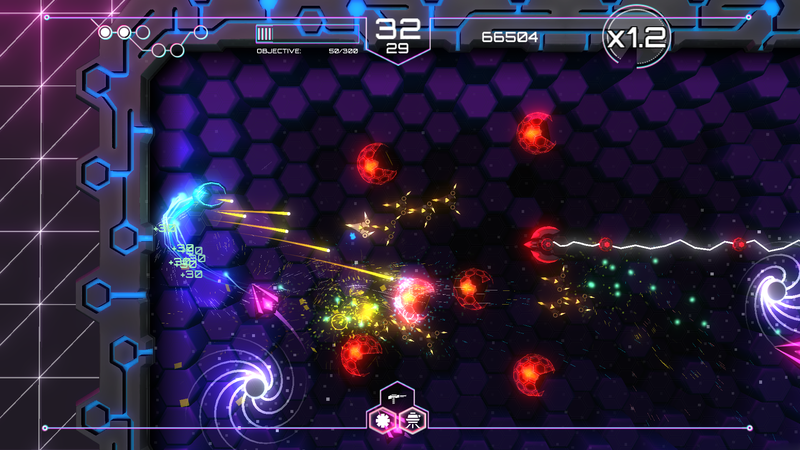 It wouldn’t truly be a SHMUP without brutal bosses, and here Tachyon Project does not disappoint. There is a grand total of four bosses in the game, and they will greet you at the very final Wave of specific levels. The first one, displayed above, is comprised of rotating shields to keep you from hitting the core. As you do more damage, it adds more shields, which made my life very difficult until I realized how helpful Freeze Bombs were. Each boss has a unique gimmick, and they are further complicated by attendant drones which harass you as you fight them off. I was happy with all the bosses, and found each challenging, but did wish the game had a couple more. The best part of the game is that it was built with players in mind, and is fully compatible with XBox 360 controllers. After playing the game for three hours, I don’t think it would be possible to survive using keyboard and mouse controls. The game handles very fluidly, with one stick controlling Ada’s movement and the other her gunfire, and Secondary Weapons mapped to the shoulder buttons. The visual design of the game is a bit of a mixed bag. Though I love the colorful enemies and appreciate the frantic explosions and gunfire, each and every level essentially looks the same, with the exception of stealth levels, which are shrouded in darkness. It would have been nice to have a bit more level variety, visually speaking. Each of the bosses also looked great, and none was a clone of the other, least of all the crazy final boss. The only quirk I found visually was that, a couple of times, the dialogue in the cutscenes would randomly cut off, leaving me wondering what I was missing. Musically speaking, the game is well made. Frantic techno beats keep you gaming, with minimalistic sound effects to distract you. What was especially cool was how the music changed to suit the flow of battle. When you’re winning, it sounds triumphant, but it gets downright ominous when you’re in danger and running low on time. Also, whenever you hear a unique enemy sound effect, that is a warning sign to pay attention and act quickly, since only the mean enemies seemed to have unique tones. 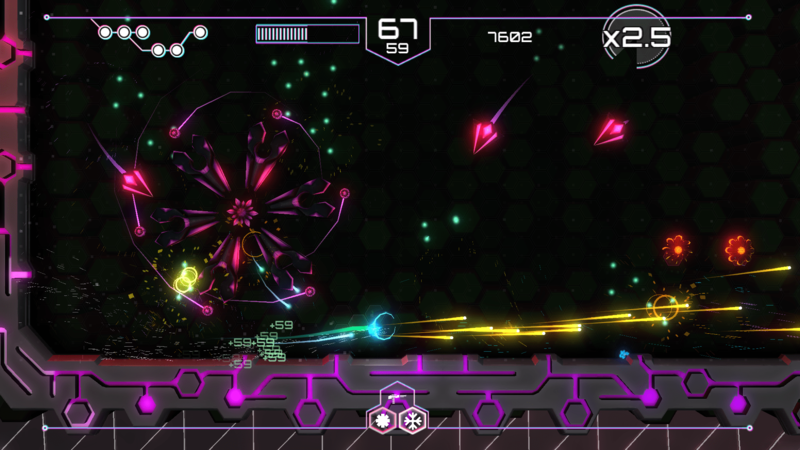 As far as replay value, Tachyon Project is pretty standard. You can get through the entire Story Mode in two to three hours, but there is also a Challenge Mode to keep you playing. Here you can find several different options, such as Endless Challenge. Your progress here can be shared to leaderboards, for the more competitively-minded gamer. You can also go back an play levels in Story Mode to unlock Weapons and Perks, if you’re so inclined. But, unless you’re truly obsessed, you probably won’t spend more than five hours on the game. That said, I was very satisfied with my time with Tachyon Project. It was different enough to hook me, drew me in with the story, and left me desperately wanting a sequel. I can’t think of higher praise for a game than that. 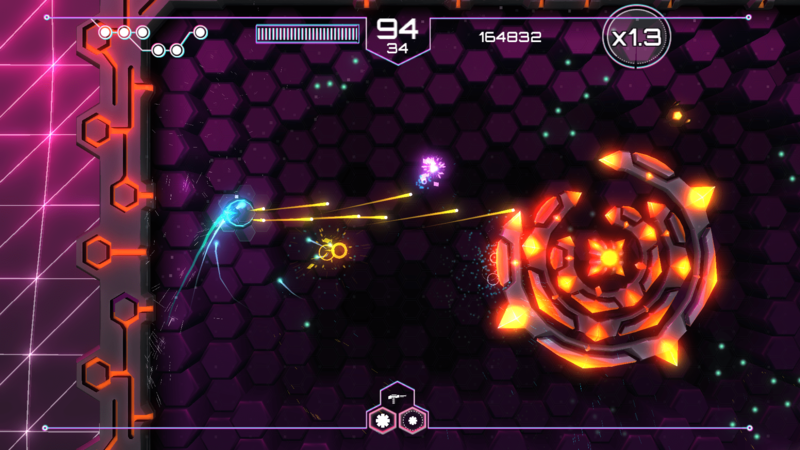 If you have $9.99 to spend, Tachyon Project is a great game for both Steam and XBox One.